"This is going to be a terrible day; I have no one to hang!" I've known quite a lot about my mom's side of the family for a while. I only really knew one of my grandparents. My grandfather had gone on a genealogy kick a while back and filled in most of that side of the family, but my dad never liked talking about his family. * What is your earliest memory? My father and his parents were driving back to Carrolton, MS when a tornado came down and moved the car 100 feet. There was no damage and they drove on. * What were your [father's] grandparents like? Maternal Grandparents - Emma and William Bluford Vance. My dad knew them very well, because they were still living and my grandmother would drop my dad by their place from time to time. My dad never really liked, them, though. Bluford had a law degree from Vanderbilt, but never practiced law. Instead, he became Sheriff of Carrolton, MS. 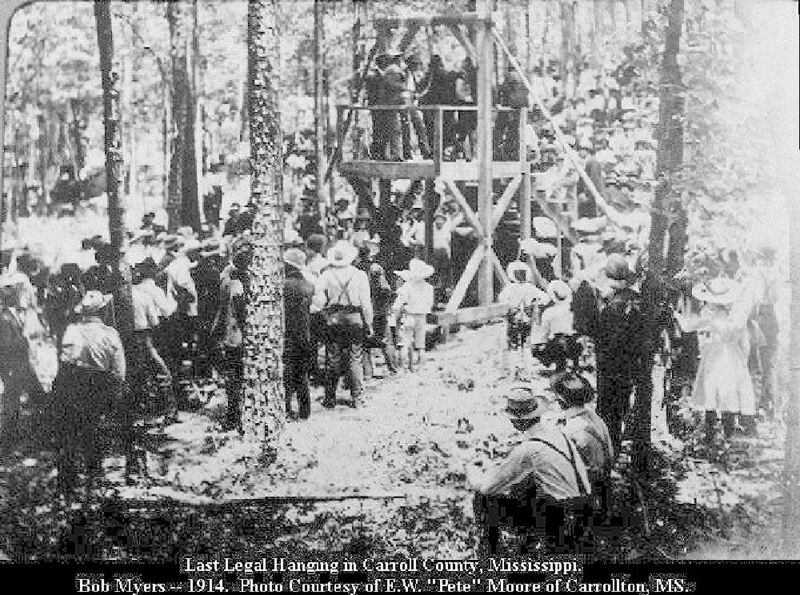 I've found this article describing the last legal hanging in Carrolton, MS. You see, this was one of Bluford's first hangings. There was a mood for lynching, but McDougal’s family insisted the case be tried. Caught in June 1914, Myers was appointed an attorney, J.W. Conger. Oct. 31 at the Carrollton courthouse, a jury convicted Myers. Fifth Circuit Judge James A. Teat sentenced Myers to be hanged Dec. 11 by Sheriff W. Bluford Vance. Conger didn’t file an appeal. The day of the hanging was apparently a celebrated occasion. Bluford used to love his hangings (although he didn't care for little things like trials). Bluford used to remark every morning, "This is going to be a terrible day; I have no one to hang!" He would sometimes find someone to hang. My dad was once brought to a hanging by Bluford; my dad did not think it was a very grandfatherly move. Bluford became a millionaire off bribes from bootleggers (in a dry county). The money was lost to gambling later on (or so I've heard). * What were your parents like? My Dad's Father- Used to like to sit around and read a lot. Very literate, smart. Liked Football. Went to Ole Miss and got a degree in Civil Engineering. Worked on the Manhattan Project*. My Dad's Mother- A gifted pianist, once taught Mose Allison, went to Juilliard, wanted to be concert pianist, but then got pregnant. My dad hated taking lessons from her. * What are you proudest of in your life? Answered the lowest point: Dad was going crawfishing with friends, they stopped at Schweggman's to get chicken necks (bait), the line was too long, so my dad tried to just shoplift, but got caught. "Getting caught stealing chicken necks is about as low as a man can get." That's it for now. Thought it was interesting, so I'd post it. It's also amazing the genealogical resources out there these days. * One of the things that always confused me growing up was why was my dad born in eastern Tennessee, despite his whole family being from the Greenwood area. Now I know. I don't know exactly what he did (a topic for future research), but I've been told by family friends it was mostly roads and bridges in eastern TN. After the introduction, the next 5 minutes of the video is an animation of global nuclear explosions through history (over 2,000). I've been reading through Richard Rhodes' fantastic series of nuclear history. I've read "The Making of the Atomic Bomb" and I'm rapidly working my way through the "Twilight of the Bomb" book. I've got "Dark Sun" and will get to "Arsenals of Folley." Richard Rhodes is a fantastic writer and a great researcher. The first book, about Trinity, Little Boy, and Fat man, was written in the early 80's, and the last book was published just last year. That's an amazing stretch of attention to one topic. Just wanted to post the video for now. Molleresque, a photo by Noladishu on Flickr. A positively Molleresque article from the Times-Pic. 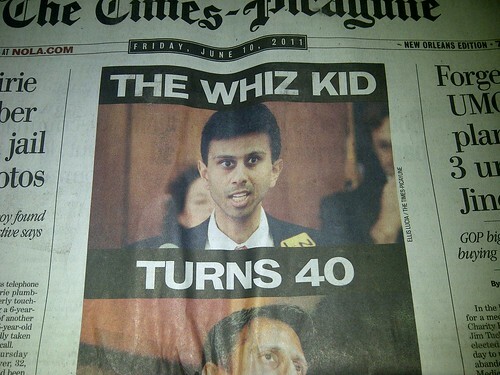 You know, the last guy the paper liked calling a 'Whiz Kid" is now a "broken, humiliated man" in the federal pokey. ✭Transocean raps USCG Report. Wait until you see the actual Transocean report before you believe anything that Transocean says about the USCG report, but I will say this: all of these separate investigations is a GOOD thing. ✭ Cascade-Chinook Chain Failure and discussion from P.E. ✭ Unions moving offshore? Also includes a little history about the last time unions did a big push offshore. 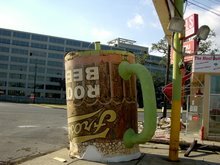 ✭ Leviathan Brine Blowout? Lots of different types of blowouts (crude oil, like Macondo, Fracking fluid, like the recent one in PA, and now brine). A blowout is simply a severe underbalance between mudweight and reservoir pressure. ✭BOEMRE Drilling Checklist. Used for approval process of new drilling permits. A remarkable amount of cooperation and communication between regulators and industry. ✭gCaptain commentary on USCG Deepwater Horizon Report . I don't agree with some of the gCaptain comments, but it's interesting reading. ✭When does "Stop Work Authority" actually get used? Focuses on Oil industry. Good example of "human factors engineering." ✭ The Forgotten 11 . The Deepwater Horizon dead. ✭ Tanker Mogul at center of oil picefixing investigation . I'm not sure about this one. Speculators DEFINITELY manipulate the market in the SHORT TERM, but in the long term, the conventional wisdom is they make the market more efficient. ✭ Specific regulatory changes asked for (mainly Maritime Licensing). Another one from gCaptain. ✭ BP Survivor wants all rigs reflagged as US Ships . One of those "why didn't we do that years ago"-ideas. A column by an MIT engineering professors that goes through engineering failures (mostly materials failures) and their post-accident investigation. 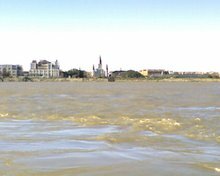 Great discussion from XKCD about the rising levees, with a plug for McPhee's "Control of Nature." ✭NYT: At Well-Paying Law Firms, Some Going cheap in Legal. Wonder why some firms took so long to try to cut costs in legal, while cutting their engineering staffs to the bone? Maybe they thought the consequences of crappy engineering wouldn't be as bad as crappy corporate defense. Ask that to BP and see how they respond. ✭ NOLA.com : Sen. Vitter's spokesman dares Obama administration to prosecute his boss Umm, Mann Act (aka- the "White Slavery Act" with its 10-year statute of limitations) anyone? Bear Grylls makes homemade wetsuit: Umm..
✭ YouTube - buran briefing. Bonus points for 80's era Soviet music. ✭ Faulty Towers: The Crisis in Higher Education | The Nation . From 1971 to 2001, the number of bachelor’s degrees awarded in English declined by 20 percent, but the number awarded in math and statistics declined by 55 percent. The only areas of the liberal arts that saw an increase in BAs awarded were biology and psychology—and this at a time when aggregate enrollment expanded by something like 75 percent. ✭ 5 Ignored WikiLeaks Hits of 2011. Lawyers Guns and Money have been running a series of posts about the 'most prominent politicians in each state.' The list is going in order of the state's admission to the union. The list is weighted towards national impact and historical impact (away from, but not excluding, recent [post-2000] politicians). They've made it up to New Jersey, so it'll be a while before they get to Louisiana. 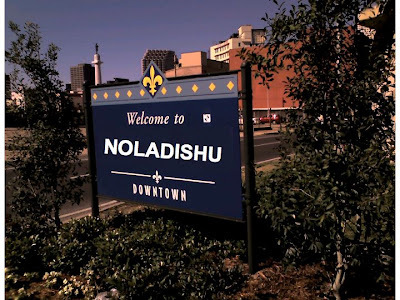 It got me thinking about what Louisiana's list might look like. There is the (excellent) Louisiana Political Museum, in Winfield, LA, but I'll distill it down a bit and use the metrics of LGM (national significance and historical characters). #1, 2, AND 3- Huey Long. No doubt whatsoever. T. Harry Williams still has the best history of, love him or hate him, the most important man in Louisiana's history. I'll also group all the Longs into Huey (they were all imitations, compared to the genuine article). I give him all top 3 slots and leave the rest to a list in historical order. W. C. C. Claiborne- The first Louisiana Governor, important in the lead up to the Battle of New Orleans and his handling of the Haitian Emigres. Zachary Taylor- The only Louisianian who made it to the presidency. He was the last president who actively owned slaves during his presidency (mainly through marriage). I've always found him an interesting character because, despite owning slaves, he was generally hostile to slave interests (probably because of his travels in the military) and his very short term in office (due to abrupt illness and death). Henry C. Warmouth- "Carpetbagger" governor who did build up quite a formidable block of emancipated black voters. Huey Long secretly admired his political cunning. Murphy Foster- NOT Mike Foster, Jr. Murphy Foster was one of a line of Conservative/"Reform" governors in the post-Reconstruction era, but he was the only one that actually practiced what he preached when it came to gambling. He shut down the NOTORIOUS Louisiana State Lottery Company (unlike his "reformer" predecessors that condemned the Lottery when campaigning and then exploited it to levels that even the carpetbaggers would consider obscene. Dutch Morial- The only black politician on my list, partly because of his Civil Rights record prior to his mayorship. PBS Pinchback wasn't around long, and Bill Jefferson, frankly, did nothing of note with his ample talents. $Bill was a brilliant Harvard Law grad, worked his way up to become a senior Democrat on the House Ways and Means committee and a close ally of Bill Clinton and all that talent went to waste. He used it to enrich his family and local political allies (like Eddie Jordan). Bob Livingston- Short-tenured Speaker of the House. Edwin Edwards- Louisiana's only 3-term governor. See Huey Long. Mary Landrieu- The most national significance of any of the Landrieu's (mainly for being on the Senate Appropriations Committee). That's my list, given the slant towards 'national significance.' Am I missing anyone? What would your list look like? Taking responsibility. A foreign concept to certain businesses today. A copy of this note should be hammered onto the forehead of ever single BP executive.